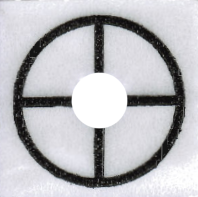 Place the sticky DOT TARGET MARKER, target side face down, on the back of the project. 50 pieces including 12 DOT target markers, 3 wire tracks, 3 landing pads, 6 accessory pieces, a sticky level, drywall hooks and nails. 19 pieces including 6 DOT target markers, 3 wire tracks, 3 landing pads, 6 accessory pieces, and a sticky level. 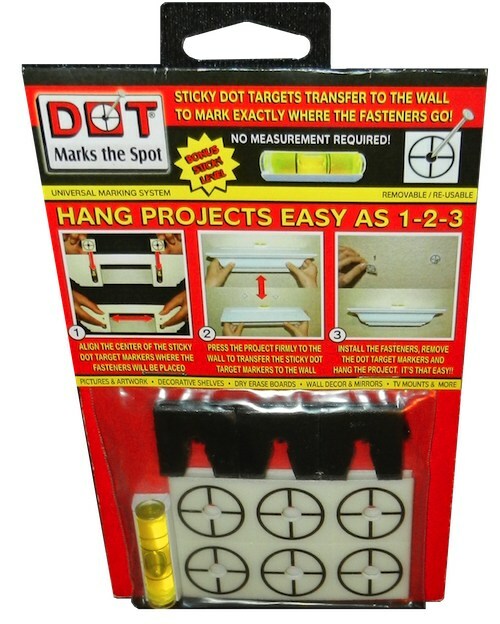 Those two kits can be ordered directly from DotMarksTheSpot.com, or you can get an even less expensive kit from our sponsor Rockler for just under $6. That’s about as cheap as convenience and simplicity come these days. Now, go hang some stuff!